In December 2012 we were approached by the University of Groningen in order to qualify for a light art installation in the main hall. Together with five other artists (collectives), we have presented our idea in late January. The contract was finally awarded to Studio Peter Musschenga. Therefore our submission, Tree, Cloud, Pillar, unfortunately, survive only as an idea. Below you can read a short description of Tree, Cloud, Pillar. The artwork is inspired by the shape and function of the neuron, in which the parts of the neuron, the dendrite, the soma (cell body) and the axon translated into input, core, and output. The work consists of three different objects that have their own shape and function, but also related to each other. In addition, to distinguish the physical appearance of the objects and a more invisible computer network and database. The interaction of the visitors with the network and the database, exerts influence on the appearance and shape of the objects. Due to an endless flow of information, put in motion by the visitors, the artwork will be constantly changing. This object has the shape of an inverted tree and depends from the left wall at the entrance. The shape is an enlargement of a portion of the map of the center of Groningen , the University Library as a starting point at the top and is made of wood and glass plates above a LED matrix . Tree serves as an ‘input’ . For example, the user may indicate its current emotion via an application , this is associated with a color emotion . The color of the tree takes an average of all imported moods and emotions . In this way, the visitor can see what’s the prevailing mood in the UB . This emotion-color flow through to the Cloud . 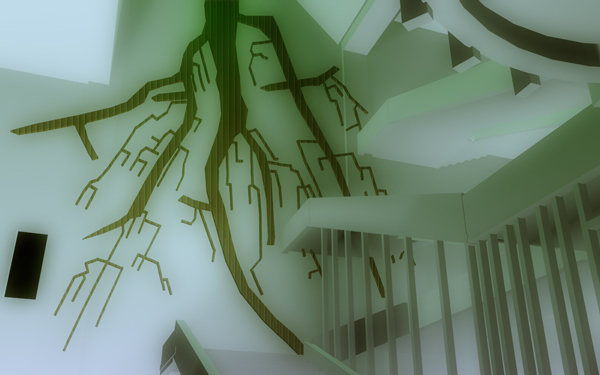 The tree also shows when a visitor enters the library . This is done by means of a light signal that runs from the bottom ( the branches ) upwards . Tree stands as input object open to multiple interpretations regarding his input . A new interpretation may arise from a brainstorming session with students or a new idea of ​​the makers and can be added as new functionality at any time. The second object depends, or rather floating in a central location, right in the arrival hall of the library. Selected for the form of a cloud. A metaphor for the digital cloud, but also a form some resemblance to the brains. It is the core, the soma. The cloud is made of wool and looks therefore very light. The object is illuminated and projected from the inside. In the Cloud comes knowledge, intuition, and emotion together. The core is the social, human, and unpredictable and associative. They will help you on your quest for knowledge and information because its network spreads over the world. Mostly useful knowledge, but often not. Patches of queries and associations are projected in text, and (especially) image. Through the core, and an associated app, you will also be in touch with fellow students and other visitors to the Library, with the community. 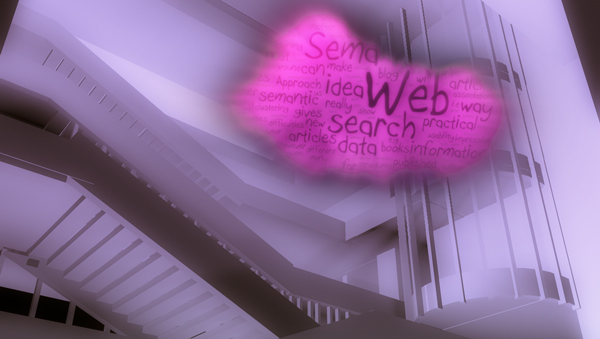 All communication, both interpersonal and man and machine, running through the cloud. 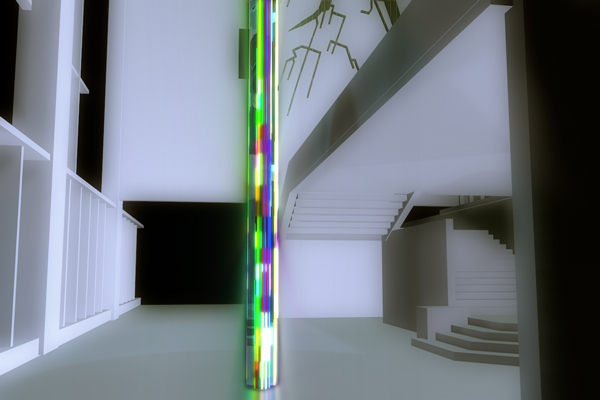 The pillar is a square post, which seems to disappear into the floor. The pillar is constructed of glass plates of 30 x 30 cm with a circular hollow core, 9 meter high, the inside of which is filled with a LED matrix. As with the tree are the various LED’s to compare it with the pixels of a computer screen. This offers opportunities to show forms and images on the pillar. The pillar acts as output. If the output of the cloud, as well as output from the library. For example there are data visualizations to see the amount of borrowed books divided into categories. 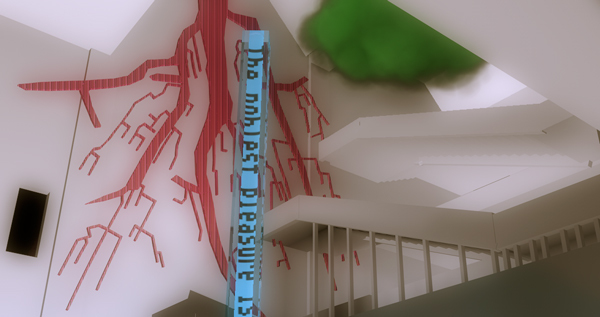 The pillar also analyzes the data from the cloud and goes looking for the names of a day. The names of one day mentioned most. That can be a scientist, philosopher or a celebrity. Following a name, a quote sought and displayed for a longer time on the pillar. The pillar is a calculating and associate relevance to. It is rational output. To increase the interaction between man and the work we want to use a smartphone app. Through this app, the visitor can leave emotion at the Tree, enter into a dialogue with the Cloud or come into contact with other visitors through the Cloud. In turn, the column can leave a daily quote via this app. The app can only be used in the library around the artwork. In this manner, the local and physical nature of the artwork emphasized.